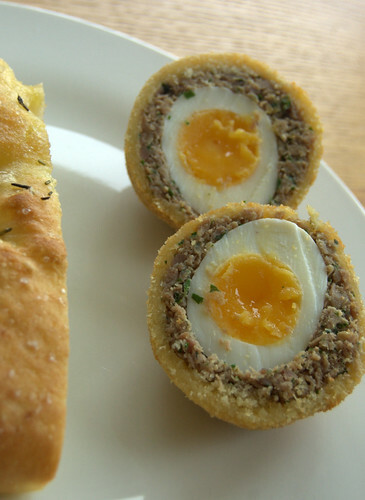 Duck Confit Scotch Eggs, originally uploaded by still awake. Wonderfully indulgent Scotch eggs with a crispy breadcrumbed exterior, an interior of just past soft boiled eggs, and a duck confit meat filling. Bought from @Sourcefoodcafe today (http://twitter.com/sourcefoodcafe). British tourists were taking photos of the bearded proprietor holding a bunch of coriander. I would have liked to have done the same but he was decidedly unimpressed. This entry was posted in Bristol, Food and tagged Bristol, Duck confit, Food, Scotch eggs, Source, St Nicholas Market. Bookmark the permalink. James, it was amazing. That Source food place is so good although not exactly cheap. Mmm, they look like they are to die for!